In 2010, when former Notre Dame women’s basketball player Natalie Novosel made a commitment to off-season training, she went from averaging just 5 points a game her sophomore year to 15 points a game and leading the Irish in scoring her junior year. Her 27-game streak of scoring in double digits (crossing from her junior to senior years) is second-longest in school history. Natalie’s off-season training was sport specific: playing and strengthening, and lots of it. Athletes everywhere are facing the same questions of how to structure their off-season training program, and the decisions we make will determine the success we enjoy in the months that follow. For elite and recreational runners alike, the off-season has typically been a time to build a strong base – miles, and lots of them. The physiology of base training has been long accepted in the endurance community. We have been told it is not possible to build both aerobic and anaerobic systems at the same time very well, that the more work you perform aerobically, or in the presence of oxygen, the more efficient you are. We believe aerobic training produces muscular adaptations that improve oxygen transport to the muscles, reduces the rate of lactate formation, increases energy production and utilization, and teaches our body to use fat as a primary fuel source. As with everything running, however, there is a counter argument from the scientific arena that discounts the benefits of the slow-paced base building phase. Their studies suggest the most gains occur when running fewer miles faster. That leaves us all to make a personal decision as to whether we will build a base of higher mileage at a slow pace or possibly ignore the base building phase altogether. The cardiovascular adaptations gained by putting in relatively high mileage for a prolonged period of time was first advanced by Arthur Lydiard in the early 1960s, when New Zealand’s Peter Snell and Murray Halberg won Olympic titles and broke world records with at-the-time unconventional base training of 100-plus mile weeks. Lydiard suggested a relatively sedentary person could progress from couch potato to 100 mile weeks in just 9 weeks’ time. There is much debate over the risk of this plan but it has been successfuly adopted by many a runner. The key to this fast mileage build-up is in the runner’s ability to slow right down. For example, if you are a 16:30 5k runner, base building pace would be around 8-9 minute miles. For a 20:00 5k runner: 9:30-10:00/miles, and for a 25:00 5k runner: 11:15-12 minute miles. Slow has a specific purpose in our portfolio of speed. John Molvar wrote his thesis on Arthur Lydiard. He read 4 of Lydiard’s books and 7 books by others who wrote about Lydiard. 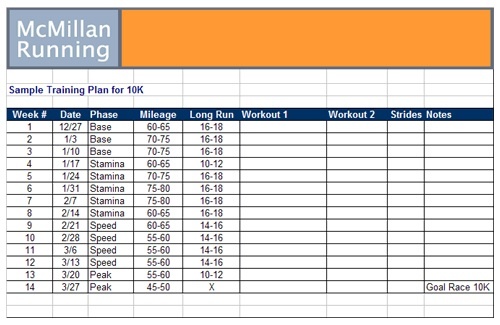 He includes a proposed 9-week training plan based on Lydiard’s suggestions on how to ascend to 100/mile weeks. To succeed at Lydiard’s system, purposely manipulate your average training speed to avoid the pitfalls of too much effort in too short of a training period. Cyclists use base building to stimulate the slow twitch (type 1) muscle fibers, to grow and strengthen the heart and to teach the body to conserve its glycogen stores within the muscles and vital organs. The purpose of Phase I of the Base Building schedule is to ascend to peak mileage (most coaches add speed work in Phase II) and there are lots of ways to plan your ascent. Jack Daniels includes six weeks of base building in every marathon training program – roughly creating a 24-week marathon training plan. The first 3 weeks, even in the elite plan, are slow runs of the same distance/time every day. Every coach has their own base building philosophy and if you are particularly inclined toward one program or another, use that program but eliminate or drastically reduce the Quality Workouts. For example, follow Hal Higdon’s Novice program and work your way through the Intermediate and Advanced programs. Start with the Pfiz 55 progressing to the Pfitz 70 and Pfitz 85, etc. (the numbers representing the total number of miles per week). Following a marathon training plan gives structure to your runs by specifying each run’s distance and weekly mileage build-up. Do you believe in a slow-paced Phase I or speedwork throughout? Don’t let the slow pace frustrate you. I watched the Kenyans run in downtown Chicago in the days before the Chicago Marathon for many years. They had a slow, comfortable pace. They talked to each other – one guy in particular used his hands to exaggerate whatever point he was making all the while they were running. It was not uncommon for my husband and I to be walking our five dogs faster than these guys ran. Hal Higdon talks about how he ran at the same pace as a lady who was walking and pushing her baby in a stroller! Slow does not mean weak. LSD or Speed. If you choose to delay speedwork until Phase II, as many coaches recommend, resist the urge to throw in a dash of speed here or there during Phase I Base Building. Some coaches say even one bout of speed will destroy all the gains of the long, slow buildup. Practice good form. It is common for runners to develop bad habits when running slow. It happened to me last year when I realized I was turning my foot ever so slightly at the back of the stride, which eventually caused ankle soreness. Master Sifu says when we are fighting if we let our ankle roll or our elbows stick out too far, we’re loosing energy just as if we were a water hose with a hole in it. You want energy to begin in the strong core, move down through powerful legs and into the ground through the ball of your foot. Take zero days when you need them. Although we should never run through an injury, Lydiard says if you are tired or sore, just run slower. Eventually, your body will adjust to the higher mileage. Previous Post 5 Things To Do During Your Summer Break. Very interesting post, thank you for all the information. Comes in very handy as I’m mostly done with racing until next fall, and figuring out off season training. I’m in the same boat right now and I wanted to try something a little different than last year’s plan. There were a few surprises for me as I researched the information and I hoped others would find what I learned helpful. Thanks so much for reading!